Strengthening its position as the go-to supplier for complex renovations, Aggregate Industries’ unique Lytacrete solution has proved crucial in the £5 million structural refurb of Nene Bridge in Peterborough. Constructed over the River Nene in the 1970s, Nene Bridge is an award-winning structure, with its ‘v’ shaped pier making it iconic. As a major traffic route, it provides access to vehicles travelling from the A1 to A47, as well as pedestrians and cyclists going between the north and south of the city. The bridge is currently undergoing extensive refurbishment, including reinforcing the bridge piers and replacing bearings, as part of a repair programme being carried out by Skanska. Recent inspections of the bridge showed signs of structural distress to the bearings and cracking to the saddles of the piers. Traditional methods of replacing the bearings were not possible because the ornate architectural design of the original piers did not allow space on top of the piers for jacks to be positioned beneath the superstructure replacing the bearings. Furthermore, jacking points were not provided within the box girders. 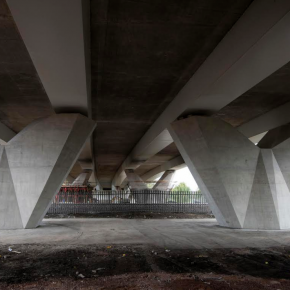 As such, the designers at Skanska considered various options for replacing the bearings and strengthening the piers, whilst remaining sympathetic to the appearance of the original piers. This led them to develop the solution of encasing the piers in reinforced concrete jackets, to strengthen the piers and also to provide jacking platforms for the superstructure lifted to enable the bearings to be replaced. 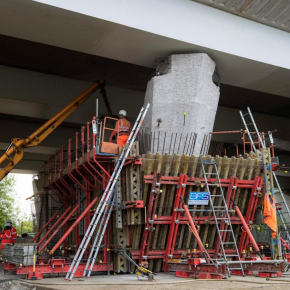 For this solution to work, the concrete used in the jackets needed to be strong enough to strengthen the piers and to carry the jacking loads, self-compacting, to flow around the dense reinforcement, and lightweight, to lower the additional load on the foundations. As the first bridge repair of its kind in the UK to put this method into action, Aggregate suggested the use of Lytacrete, a concrete mix using the innovative lightweight secondary aggregate, Lytag, which can effectively reduce the dead load by approximately 25% over normal weight control, while offering the same level of structural performance. Throughout the project, Lytacrete was placed around the piers, with its high strength and self-compacting nature meaning the mixture needed to be free flowing to guarantee it could be placed around the complex and congested steel reinforcement. As a result, the solution proved ideal for strengthening the pier, as well as maintaining its unique ‘v’ shaped design. The concrete can also withstand the jacking of the deck of the bridge to replace the bearings – a core process of the refurbishment. Over the next 12 months, Aggregate Industries’ robust delivery framework will also ensure all concrete arrives on time and to the exact specification, which will make sure the concrete is available to surround, rebar and form the required shape. Simon Wycherley, General Manager at Aggregate Industries, comments: “We’re incredibly proud to be involved in the repair works of Nene Bridge, the first project of its kind to use our Lytacrete solution in this way. Dan Wood, Site Manager for Skanska Infrastructure Services, said: “Lytacrete has performed well on the Nene Bridge bearings project, successfully flowing around the complex steel reinforcement to form the unique geometry required.